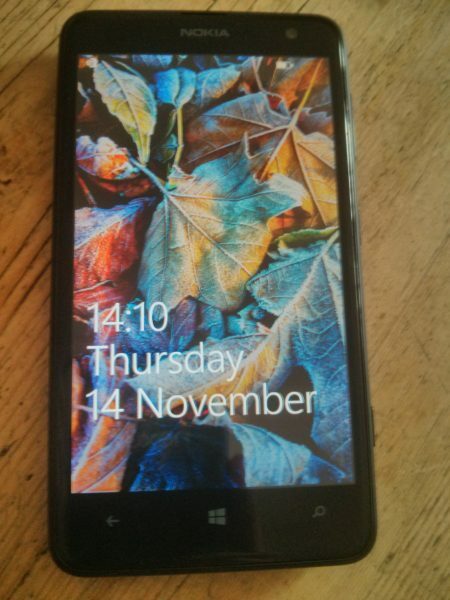 Yesterday I took delivery of the Nokia Lumia 625. It’s not mine and I’m not allowed to set it up yet, so these are my initial thoughts before doing a proper review. 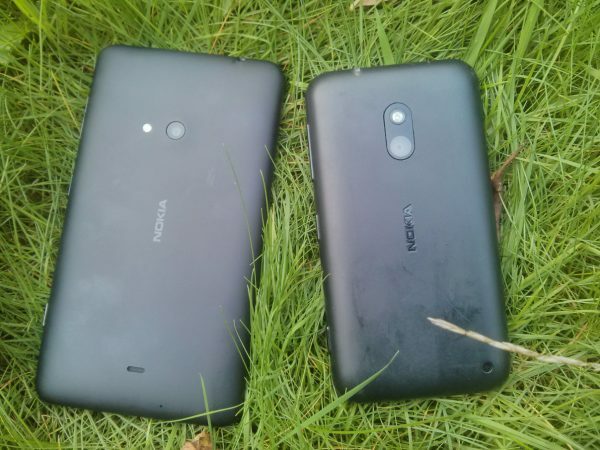 Here is the Lumia 625 along with its predecessor the Lumia 620 lying next to each other. The 625 is the one on the left. As you can see the 625 is significantly bigger than the 620. This picture also shows how much more reflective the screen is on the 625, you can barely distinguish the screen from the bevel on the 620 but on the 625 there’s a very clear distinction. 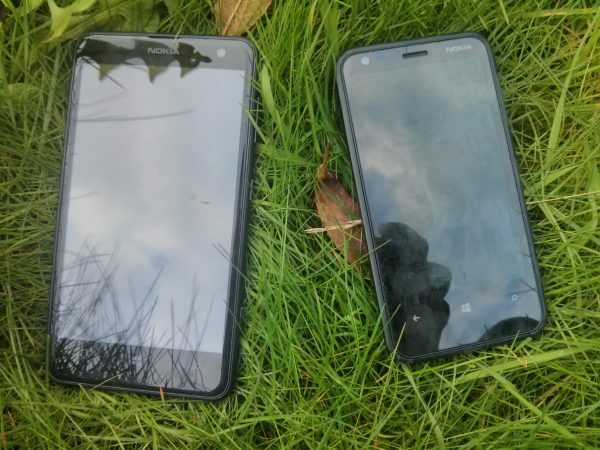 Here are the phones turned over onto their backs. The speaker on the 625 has been shifted to the centre of the phone, and the camera is slightly smaller. Here they are on their sides, showing the volume, power and camera buttons. Again, the 625 is on the left. The edges on the 625 are rounded, in contrast to the 620 which has a flat front face with a curved edge on the back. It’s also slightly thinner. What you can’t see in the photo is that the back of the 620 is completely flat, whereas the 625 has a slight bump. 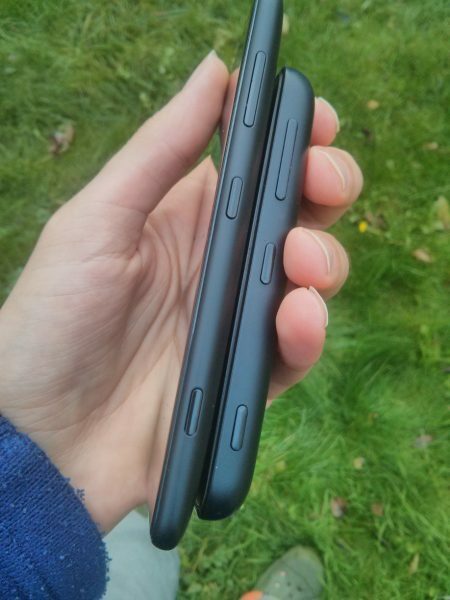 The bump doesn’t make up much space but you can feel the difference when you set the phone down on a flat surface. 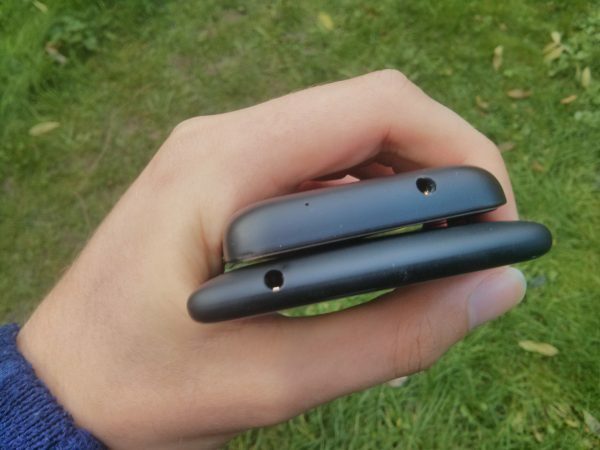 Here are the tops of both phones, showing the changing of headphone placement. The 625 is on the bottom. Lastly, here’s the Lumia 625 on its own displaying the lock screen. It’s difficult to make judgements on the screen quality from my shaky photos. It’s true that the screen is comparatively low resolution for its size, and it still remains to be seen whether that will turn out to be a major issue. I haven’t really spent enough time with it yet to form an opinion on it. The phone supports 4G connections, I probably won’t have the chance to test it out because as yet I’m not on a 4G network. It’s good to know the capacity there in case it’s ever needed in future. Aside from the phone, inside the box is a pair of headphones, a USB cable, a small manual, and a charger.